This field day was outlined in the last newsletter (Apr-June). The Ogle's property, where the field day begins, is at 1304 Glen Allyn Road, south-east of Malanda. See 'Cloudland Field Day' article below, by Dave Hudson. The 30th AGM will be held on Friday 14th September in the Yungaburra Community Hall commencing at 7.30pm. Our guest speakers will be Stanley and Kaisa Breeden. Stan and Kaisa are the artists who created the TREAT Display Centre in 2003. Earlier this year they released a book with stunning photography, 'Rainforest Country', and they will tell us about their experiences and photographic techniques to produce the book. Copies of the book will be available at the AGM. Annual reports by the President, Treasurer and Nursery Manager will be followed by the election of TREAT office bearers and committee members for the next year. Members are reminded that they must be financial when voting for the new committee. Subscriptions will be accepted at the AGM. A General Meeting follows the AGM. The evening concludes with a supper, and plate contributions are appreciated. Everyone is welcome to attend. Can Tree-Kangaroos Detect Predators by Smell? There will be a field day on Saturday 25 August at Cloudland Nature Refuge on Seamark Road, commencing 1.30 pm. Cloudland is one of the sites chosen for the Caring for our Country (CFOC) project 'Making connections: landholders restoring connectivity in the Wet Tropics'. This collaborative project is helping to restore habitat in high-altitude areas to benefit unique rainforest species which are adapted to cool conditions and threatened by rising temperatures (e.g. golden bowerbirds, ringtail possums, prickly skinks). The project is based around work done by scientists at James Cook University who undertook targeted research to map priority areas for protection and restoration. The Wet Tropics Management Authority secured CFOC funds to initiate on-ground activities, and brought together an extensive network of scientists, conservation practitioners and community groups. See TREAT newsletter Oct-Dec 2010. This field day will highlight the research being conducted by Dr Luke Shoo from the University of Queensland and Prof Carla Catterall from Griffith University. They are now working with landholders to investigate cost-effective ways of rapidly converting disused pasture to rainforest, and new approaches to encourage ground-dwelling animals to move into revegetated areas, introducing structures that mimic their natural habitat of fallen and decaying wood. Early results are very promising. The field day will also allow another look at the revegetation plantings in two broad corridors across an open pasture area. TREAT held a previous field day to check them out, in June 2009. We (David Hudson and Robyn Land) established them from 1996 - 2010. See TREAT newsletter July-Sept 2009. Cloudland is 8.5 km along Seamark Road off the Malanda - Millaa Millaa highway. Parking at the property is limited, so car-pooling is necessary. Meet at the beginning of Seamark Road - there's plenty of parking there on the roadside. A minibus will be provided as a shuttle. It's a steepish 100 metres walk down to the trial plot sites but we will provide a 4WD for those unable to walk down. The trial plots themselves are easy going. TREAT will be providing an afternoon tea as usual. TREAT members and the QPWS officers located at Lake Eacham Nursery provided a great deal of support to the University of Queensland's Environmental Management Tour which visited in July over several years between 1996 - 2005. The annual tour was arranged around visiting the Lake Eacham Nursery on a Friday so that students could be exposed to the workings of a very successful and long-term community environmental group. As then Tour Leader I greatly appreciated the help by QPWS staff in helping environmental management students understand how to manage a nursery and work with the community to achieve off-park biodiversity conservation. Complementing this was the exposure to TREAT community group members so students could gain an understanding of what drives community to volunteer countless hours to restoring and conserving nature. In the early years Nigel would lead the group and we were honoured to have Joan lead discussions at morning tea time about activities and achievements. Nigel even took us out to see the early stages of Donaghy's corridor plantings so the students could see first-hand what could be achieved with co-operation between government (i.e. QPWS), CSIRO Forestry, local landholders and TREAT. In later years we were astounded with the newly built Visitors Centre and had presentations by various people on various topics amid its outstanding displays. On some occasions QPWS officers supervised Industry Placement students following the Tour, with some of these students returning to Atherton and places north in full-time employment in the nature conservation field. I am sure the experiences gained by the students in visiting the TREAT and QPWS nursery and listening to the experiences of a range of people will stay with them for a long time. Finally, I would like to thank again the QPWS staff and TREAT members who helped students and myself gain a better appreciation of 'Community Nature Conservation'. Lauraceae is a large and important family with around 3,000 species worldwide. Here in the Wet Tropics we have 98 species in 8 genera. Despite this, only a few examples are regularly included in local revegetation plantings and this is because many are intolerant of the type of conditions in which we normally plant, that is, exposed to full sun and wind without guaranteed water. Although hardened off at the nursery, seedlings from this family suffer as soon as regular watering is withdrawn. The exceptions to this are Litsea leefeana, Neolitsea dealbata and Cryptocarya hypospodia. All of these are common in rainforests on the Tablelands and can survive our typical planting conditions. Our more detailed look at 8 species therefore starts with these. This tree is not named after a leaf as you might think. The species name actually relates to the original collector, M. Leefe. It grows to 30 m with a dense crown of dark leaves. New growth is a pinky purple colour with soft hairs making it look velvety. The fruit are shiny black, oval shaped drupes set in little green cups, a bit like acorns. They are eaten by many birds and germinate easily. This tree can grow to 15 m and is commonly part of the understorey, especially on the edge of rainforest. The name dealbata means covered in white powder, but the white substance on the underside of the leaves is actually waxy and melts if heated. It gives the tree a very distinctive and easily recognised look, most noticeable when caught in one's torchlight at night. The Tooth-billed Bowerbird uses these leaves, white side up, amongst other leaves as a court decoration. The fruit is small, round and usually numerous in little clusters all over the branches. It changes from bright green through yellow and red to shiny black, often with all stages of ripeness showing at the same time ,making it very colourful. Flocks of birds, especially pigeons, are attracted to the fruit. New leaves are particularly beautiful, being pale pink with white silky hairs, changing to pale green, and drooping downwards, making them very noticeable. I'm looking at these three together because they have many similarities. They are all large trees to 30 m with strong buttresses, dense crowns and large spherical fruit. The flesh is greenish yellow on the Yellow Walnut, green to orange on the Black Walnut and red on the Hairy Walnut. Both the Black Walnut and Hairy Walnut fruit have shallow ribs on the outer surface. Under the flesh they all have a large hard endocarp around a single seed and are very attractive to native rats which chew through the endocarp and eat the seed. A common sight under these trees is the empty shells with one neat round hole bitten through. I guess only a cassowary could swallow these 6-10cm fruit whole and disperse them away from the parent tree. This is why whenever I find them, I pick up a few and throw them around in the forest as I walk. Propagation is incredibly slow with some taking 2 years to germinate, and the seedlings are very touchy, needing protection from strong sun and wind and regular water. So planting needs to be on the edge of a remnant or previously planted area. This is another large, dense tree but with much smaller fruit, about the size of a marble, dull black and slightly ribbed. This laurel is less tender at seedling stage and so has a wider distribution, from Cape York to the Brisbane area. On the Tablelands it grows in several types of rainforest including Mabi and Hyps, and is tough enough to be useful in these plantings. Also, the seeds germinate easily in nursery conditions. This medium-sized tree to 25 m has large leathery leaves which are hairy on the underside. The stunning new growth is bright shiny red, hanging downwards, making it more visible. The fruit are medium-sized, oval and purple-coloured with distinctive beige spots. It needs to be fresh to germinate and is eaten by many bird species. The seedlings are quite tough and can take full sun, but are very slow growing. This is another large tree with buttresses. It is one of my particular favourites, although it's hard to say exactly why. Like most of the other local laurels it has a dense dark crown, but when you look closely at the young branches you will notice that the soft, shiny, pointed leaves are arranged in a curious pattern. The slender dark twigs zigzag left and right between each leaf, making it very easy to distinguish from other trees. The orange/red fruit are quite large, up to 4cm, and fleshy. They are a flattened oval shape with a single large nut inside. They are eaten by Cassowaries, Musky Rat Kangaroos and native rats. The seedlings look beautiful, but once again are extremely soft and need extra protection by planting them next to existing trees and providing extra water if possible. There are several more local members of the Lauraceae family and many are endemic to the Wet Tropics, so enjoy the ones in your patch of forest while considering their difficult start in life. Find out which ones are right for your area and give them that bit of extra care if you grow them. The National Climate Change Adaptation Research Facility (NCCARF) has given its 2012 Community Category award to the Wet Tropics Management Authority's Making Connections project. This project is largely funded by the Australian Government's Caring For Our Country (CFOC) initiative. The Climate Change Adaptation Champions were announced at the 2012 NCCARF-CSIRO National Climate Adaptation Conference, in Melbourne on 27th June. The project is outstanding in that it involves scientists, government and non-government organisations, landholders, local community groups and individuals, all working collaboratively to restore wildlife corridors and habitat in high-altitude areas of the Wet Tropics, to benefit rainforest species which are adapted to cool conditions and threatened by rising temperatures. Luke Shoo (who nominated the project for the award) and Dave Hudson attended the conference, and received the award on behalf of the project partners. Dave talked to TREAT members on a Friday morning and showed off the award. He was amazed at the amount of NCCARF research being conducted throughout Australia, and found it sometimes scary but also very interesting and promising. The East Evelyn and Rock Road corridors form part of the project. The research by scientists Luke Shoo and Carla Catterall is also part of the project. We'll be able to observe some of their trials at the Seamark Road field day on 25th August. TREAT is one of the project partners. Other community project partners include Conservation Volunteers Australia, Tablelands Regional Council Community Revegetation Unit, Tree Kangaroo and Mammal Group, School for Field Studies, and Malanda and Upper Johnstone Landcare Association. Besides the CFOC funding, the project has also been supported by the National Environmental Research Program, Marine and Tropical Sciences Research Facility and Toshiba (via Landcare Australia Ltd). The Climate Change Adaptation Champions program is an annual nationwide search to highlight the actions and achievements of individuals, groups, communities and organisations that demonstrate leadership and innovation in adapting to, and preparing for, the impacts of climate change. Most people of the Tablelands are familiar with the Lumholtz' Tree-Kangaroo (Dendrolagus lumholtzi), although only a few know that these Tree-Kangaroos are declared as 'near threatened' under the Queensland Nature Conservation Act of 1992. Conservation efforts are needed, but we actually don't know much about their lives and populations. We often only become aware of them when we see them sitting on a tree in our backyard, at the Malanda Falls, or, sadly, when we find a dead Tree-Kangaroo. Tree-Kangaroos are often killed through vehicle collisions or attack from domestic and feral dogs or dingoes. Tablelanders have reported that Tree-Kangaroos don't seem to recognize dogs and dingoes as predators, as they have been seen sitting quietly when approached by these canines. These observations are surprising given the fact that Tree-Kangaroos have a long and unique evolutionary history. Ancestors of Tree-Kangaroos branched off when Rock Wallabies (Petrogale spp.) separated from their rainforest dwelling ancestors, the Pademelon (Thylogale spp.). This was during a period of drying in Australia that caused a retreat of the Gondwanan forests. Rock Wallabies developed a generalist feeding strategy that allowed them later to re-adapt to the rainforests when these forests expanded again at the end of the Miocene (11 to 5 million years ago). The proposed ancestor of the Tree-Kangaroo is the relic Proserpine Rock Wallaby (Petrogale persephone). This particular species of Rock Wallaby lives within enclosed forest and shows equal fondness for both trees and rocky outcrops; in fact its ability to climb trees has often caused it to be mistaken for a Tree-Kangaroo. It is suspected that over time these Rock Wallabies became more and more specialized for arboreal life, resulting in the evolution of Tree-Kangaroos. This evolutionary history brought Tree-Kangaroos and their ancestors into contact with a range of predators. One of the primary predators of the Rock Wallaby was the Tasmanian Devil (Sarcophilus harrisii) is known to possess surprising speed, endurance and climbing ability. As a result of this, the Rock Wallaby had to develop efficient anti-predatory behaviours in order to escape, such as fleeing, climbing out of the predator's reach, and hiding out of sight. Before the Tasmanian Devil became extinct on the mainland of Australia around 3000 years ago, it co-existed with Tree-Kangaroos. Amethystine Pythons (Morelia amethistina) have preyed upon marsupials since the middle Miocene and are currently the primary reptilian predator of Tree-Kangaroos. Tree-Kangaroos have been known to freeze when a python is nearby, which could be a response developed by Rock Wallabies to avoid moving near a python waiting to ambush its prey. The combined predation by numerous terrestrial and arboreal predators may have encouraged a more generalized flight response by Tree-Kangaroos to potential threats. This would cause Tree-Kangaroos to flee to the ground when threatened in the canopy, and to climb up when threatened on the ground. This generalized flight response would be most effective in an environment where all predators are native and recognized. About 5000 years ago the Dingo (Canis familiaris dingo) was introduced to the Australian mainland and quickly asserted itself as a threat to the native fauna; and about 200 years ago the Domestic Hunting Dog (Canis familiaris) was introduced by European settlers. Fatalities of Tree-Kangaroos from domestic dogs and dingoes suggest that, although Tree-Kangaroos had a long history of co-existence with various predators, they are not able to recognize these recent predators. Students at the School for Field Studies wanted to test this by observing the responsesof Tree-Kangaroos to odour cues from Tasmanian Devils, Amethystine Pythons, Domestic Dogs and Dingoes. They wanted to find out whether Tree-Kangaroos can recognize these predators and respond appropriately, or whether they respond rather curiously to these odours, as if they were novel odours in their environment. As Tree-Kangaroos are hard to study in the wild, this type of study could only be done on captive Tree-Kangaroos. Students were lucky to get access to captive Tree-Kangaroos at the Wildlife Habitat in Port Douglas and at a local Tree-Kangaroo rehabilitator's property on the Atherton Tablelands (Margit Cianelli). Much more problematic was access to the odours from different predators. In order to see differences in the behaviour of Tree-Kangaroos in response to odours from predators, these odours had to come from pure-bred predators and had to be as fresh as possible. Luckily, students could obtain skin and faeces of snakes from a local breeder, and fresh faeces of healthy domestic hunting dogs from a local dog owner near Malanda. But where could they get fresh faeces of Tasmanian Devils and pure Dingoes? Caretakers of Tasmanian Devils at the Australian Reptile Park and Devil Ark in Gosford near Sydney, and caretakers of Dingoes at the Dingo Discovery Sanctuary and Research Centre in Toolern Vale near Melbourne, helped. They collected fresh faeces, packed them in small eskies, and the samples were flown express to Cairns. This allowed the students to present Tree-Kangaroos with odour samples not older than 10 to 12 hours. In order to compare the responses of Tree-Kangaroos to predator with their responses to novel odours, Tree-Kangaroos were also exposed to odours of lavender oil and chopped garlic. To test the Tree-Kangaroos, a simple procedure was followed: first, the behaviour of Tree-Kangaroos was video-recorded when presented with a control sample, which was a plastic dish containing a wet paper towel: then the Tree-Kangaroos received the same dish, but now containing a faecal sample of one of the predators, or one of the novel odours, placed on a wet paper towel. The wet paper towel helped with evaporating and distributing the odour. Controls and odour samples were presented for 10 minutes each and the Tree-Kangaroos were given breaks in between. Also, the students needed a break from video-recording. Once all the video clips were in, a long and very tedious process of analysing them began. Students needed to spot subtle changes in the responses of the observed Tree-Kangaroos to the presented samples. To make it easier, they recorded various behavioural categories, such as comfort behaviour (consisting of grooming, feeding, sleeping), mobility (any movement on provided climbing logs or on the ground), olfaction (any behaviour linked with sniffing) and stress (behaviours such as freezing or being alerted or fleeing). For each of thebehaviours, the students recorded the duration and frequency within the 10 minutes an odour or a control sample was presented to the animals. They then compared the responses of the animals when an odour was given with those when a control sample was given. They also compared directly the responses of the animals towards different predator odours (without incorporating the control samples). The results were astonishing. The observed Tree-Kangaroos spent less time engaging in comfort behaviours when exposed to the odours of Python and Tasmanian Devil. These odours also increased the duration of stress and olfaction behaviours. This indicated that both Python and Tasmanian Devil odours were recognized as threats. The Tree-Kangaroos showed even more specific responses; they reacted to Tasmanian Devil odourby increasing their mobility, yet responded to Python odour by freezing. This suggests two things. First: Tree-Kangaroos can recognize an odour from a predator they haven't co-existed with for 3000 years and respond appropriately, namely by climbing up. This is known as 'ghost of predation past' phenomenon, which describes the retention of responses following isolation from a predator. Second: Tree-Kangaroos do not recognize predators using a universal odour image that is associated with all carnivores (often linked with their food consisting of meat), but may recognize predators on a species-specific basis. But what about their responsesto odours from Domestic Dogs and Dingoes? exposed to these, Tree-Kangaroos showed as much comfort they did when presented with lavender or chopped garlic, and engaged in less time sniffing than when exposed to the odours from Tasmanian Devil and Amethystine Python. This suggests that from these canine species were not recognized by Tree-Kangaroos as odours from predators. Altogether, their behaviour indicated similar responses to those associated with novel odours. This suggests that Tree-Kangaroos may identify odours from these canines as novel odours, resulting in more curious behaviour. Curiosity may eventually culminate in exploratory behaviour, and Tree-Kangaroos may start investigating the odour source, which can bring them into direct contact with these predators. These results are only the start to understanding why Tree-Kangaroos are so often killed by Domestic Dogs and Dingoes. The longer time Tree-Kangaroos were co-existing with Dingoes compared to Domestic Dogs, was obviously not enough for them to develop appropriate recognition and protection strategies towards the Dingo. Also, although the Tasmanian Devil and Dingo overlapped in time, Tree-Kangaroos were not able to shift the behavioural responses which they had developed towards the Tasmanian Devil, from this ancient predator to a more recent one, the Dingo. Further studies need to be done to clarify this emerging picture. How would Tree-Kangaroos respond to these predators when presented with their urine? There is much more to learn. Tree-Kangaroos are fascinating animals and can tell us a lot about their history. Just keep watching them! TREAT member Jenny Maclean, Director of Tolga Bat Hospital, is this year's recipient of one of the most prestigious conservation awards in Australia, the Serventy Conservation Medal. The Wildlife Preservation Society of Australia (WPSA) established the Serventy Conservation Medal in 1998, to commemorate the outstanding lifetime conservation work of the late Dr Vincent Serventy, his brother the late Dr Dominic Serventy, and his sister Lucy Serventy. The medal honours the commitment to conservation work by people like Jenny Maclean who do it for a love of nature rather than as a well-paid profession. The inaugural recipient of the award in 1998 was another North Queensland conservationist, Margaret Thorsborne from Cardwell, for her dedication to conserving wildlife in the Hinchinbrook and Mission Beach areas. Jenny considers herself to be in very good company. There is no doubting Jenny Maclean's passion for wildlife - bats in particular. She is well-respected locally and nationally for her long-term commitment to the rescue and care of bats since she established the Tolga Bat Hospital in 1998. " I feel very honoured to receive this prestigious award, and thank the Wildlife Preservation Society of Australia. I also thank my bat colleagues for their nomination and support. I truly value the confidence you have in my work through Tolga Bat Hospital," said Jenny. What led Cairns-born Jenny with a family background of timber cutting and cane farming, to a life of conservation? Jenny recalls an early interest in plants. The interest blossomed when, as the only physiotherapist practicing on the Tablelands, she bought her 5-acre property outside Atherton in 1978, and set about revegetating it with native plants. She joined the local branch of the Society for Growing Australian Plants (SGAP) where she met botanists Tony Irvine and Geoff Tracey. When Geoff Tracey and Joan Wright established TREAT in 1982, Jenny signed on as inaugural member number six. Jenny's introduction to bat care began in 1990, before the discovery of bat lyssavirus, when she spotted an article in the local paper calling for volunteer bat carers. "Bruce and Anne Johnson had just discovered the tick paralysis problem and had set up a bat hospital at Millaa Millaa. They invited volunteers to meet in a Yungaburra park where we were each given an orphan bat to look after, with an instruction sheet. I took two the first time, then four, then six. . . .. It grew from there." Jenny hasn't looked back since. With some grant funding and major personal input she built the first bat cage in 1996 and established the Tolga Bat Hospital officially in 2002. She completed three more purpose-built cages by 2005, including a special cage for the care of young bats who have lost their mothers to tick paralysis. Paralysis ticks kill hundreds of Spectacled flying-foxes on the Atherton Tablelands each year, mostly mothers nursing young pups. Jenny established a regular rescue operation during the tick season (October to December) to save the adults where possible, and to care for the surviving orphans. This is the busiest time of the year for the Bat Hospital when Jenny coordinates a team of volunteers, mostly live-in helpers from overseas, who pamper the young bats until they are big enough to be released at Tolga Scrub. In the latest tick season the Bat Hospital cared for 400 juveniles and 1000 adult bats with the help of 50 volunteers. Jenny has been coordinating this crisis now for 15 years. Education is an important function of the Hospital, enhanced since the opening of the Visitor Centre in 2009, which features interpretive displays on different aspects of bat biology, threats and management. 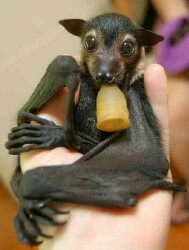 The Visitor Centre is open to the public from June to September (check Tolga Bat Hospital for details). Jenny also gives regular school talks to young students who love to see bats up-close. And as if tick paralysis isn't enough to keep Jenny busy, she instigated the Wildlife Friendly Fencing and Wildlife Friendly Netting projects in 2006 to raise awareness of these threats to fruit bats and other wildlife and has continued to coordinate the projects on a voluntary basis. Jenny acknowledges that it's not easy being the 'Bat Lady' in a small rural community with extensive fruit orchards. "It would be a lot easier to be a 'Koala Lady'!". Jenny - you certainly deserve your Serventy Conservation Medal! The weather may have looked wet, but it didn't rain on the field day of 12th May, and for the seventeen of us who attended, it was an informative and enjoyable afternoon. We car-pooled from the cattle yards, and I happened to be with Patrick Donaghy, so got some additional information on his pasture management. Nigel Tucker, who led the field day, took us to the area planted last, in 1998. Here was a double-trunked Bull Kauri, the same species as the famous trees at Lake Barrine. There was also an established vine with associated debris (4 species had been planted in the corridor), providing habitat for ground animals, a tree with damage from a borer, now providing shelter for some small creature, damage from Cyclone Larry, and lots of tree seedlings ready to take their place in the light given the opportunity. Sharon saw a basket fern at the base of a tree and Nigel explained that at the beginning, humidity and light levels are most suitable for ferns at ground level. As the forest grows and more canopy develops, these ferns find suitable habitat further up the trees. Nigel also talked about one of the catalysts for planting the corridor. Bill and Sue Laurence were monitoring biodiversity in forests and fragments and observed that the forest around Lake Barrine and the forest at Gadgarra were 'so near, and yet so far'. From the 1998 planting we walked to the 1995 planting. This took us across Toohey Creek to some open pasture on the other side, from where we could see the closed forest of Gadgarra in the distance. At the edge of the forest were many wattles, a pioneer species through which other forest trees eventually grow. Looking at the corridor, Nigel commented that the hoop pines planted in rows as a buffer, had provided some wind resistance, but in hindsight, planting them a couple of years earlier would have been better. At the corridor's edge we saw how wattles and figs were planted alternately. The wattles grow quickly and eventually die out, but by then the figs have taken over, providing lots of food. We descended to the interior of the 1995 planting. Here, Nigel could remember the monitoring transects and particular trees planted by particular people, especially the quandongs, now with buttresses developing. The area had a closed forest atmosphere and was colonised by various vines, including lawyer vine, and lots of other plants. Pollia was growing closer to the creek and light. Back at our cars, we drove to the 1996 planting, stopping at a cemented creek crossing for the cattle. Here the creek was originally covered with para grass, but now there was no grass and it was flowing strongly. Wattles and sarsaparillas had been planted on either side of the crossing to encourage intermingling of branches across the open space, for possums to use. This area also had a closed forest atmosphere. An interesting observation from the monitoring carried out for 3 years from 1998, was that when forest-dwelling rats started using the corridor, they moved from one end to the other. As the forest developed, they moved shorter distances, because the forest habitat now supported resident rats and these would defend their patch. Nigel explained that a mix of species was planted to provide forest structure, such as quandongs for height. Pioneer species provided lots of leaf litter and debris. Piles of available logs were placed in strategic areas for erosion control, and as habitat for beetles and other critters. The corridor shows that regeneration of rainforest can be accelerated by up to 30 years if restoration plantings are close to existing forest. Nigel also observed though, that if an area is not near any forest, it remains the same unless there is restoration intervention. When the corridor was created, off-creek watering troughs were constructed for the cattle and the corridor area fenced. Water was pumped from a dam at the creek to the cattle troughs, and the Donaghys started rotating paddocks. Now they have sunk a bore to supply water to remote paddocks to rotate them as well, increasing grass cover and preventing erosion. Patrick is also keen to plant more shade and shelter trees. At the end of the excursion we returned to have afternoon tea in the comfort of the shed at the yards. The final TREAT/ QPWS community planting for the 2012 planting season was held on Saturday 21 April at Ian Freeman's Cutler Road property, adjoining the Lake Eacham section of the Crater Lakes National Park. Postponed from March 31, due to torrential rain earlier that week, the day was pleasantly warm and sunny for the large group of volunteers who attended and planted around 2350 trees. Nursery staff spent the following week on site, setting up a semi-permanent irrigation system on the uppermost section away from the creek, allowing Ian to water through the drier times. On recent inspection the site has established well. Nursery staff planted a further 500 trees on the lower and steeper creek banks that were unable to be planted earlier in the season, taking the total number of trees planted under TREAT's Peterson Creek projects this year to 6950. The old nursery office and storeroom building has finally received a long overdue renovation with damaged floor coverings being removed and new vinyl flooring installed. The rooms have also been given a fresh coat of paint and TREAT has generously provided a brand new kitchen making for a much nicer working environment for volunteers and staff alike. I would like to thank everybody, staff and volunteers, who were able to assist with this project and help make the building serviceable again.